Where should I place Sleep? Sleep should be placed between the mattress and the box spring/bed platform. It can also be placed between the mattress and mattress topper/pad. The sensor should be placed horizontally at chest level. Note that Sleep can be used with a slatted frame. In this case, you may need to place a flat, sturdy object (like a cardboard, for example) between the frame and the sensor. If you sleep alone in a double bed, we recommend that you place Sleep in the middle of the bed. Can Sleep work if two people sleep in the same bed? Sleep can only track the sleep of one person. If two persons wish to measure their sleep, they can install two Sleep on the same account on two different users. Note that one Sleep must be placed under each person, on each side of the bed. Which type of mattress can I use with Sleep? Sleep can be used with all brands of mattresses. It is compatible with a wide variety of mattresses including spring, latex, foam, and memory foam. 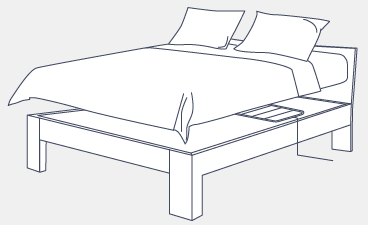 You can place the sleep sensor directly under the mattress (between the mattress and the bed platform or box spring). You can also place Sleep between your mattress and mattress topper or pad. If you feel Sleep when lying in your bed, you can place the device between the mattress and the bed frame. Note that Sleep has been tested with a mattress thickness of 4 to 15 inches (10 to 40 cm). However, the sensor has not been tested with, and is not recommended for use with waterbeds and airbeds.